Irish Portrait Artist, Muralist, Art Dealer, 18th/19th Century, Biography and Paintings. 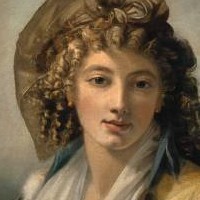 Irish Artists of the 18th Century. Although art historians consistently include Fagan within the ranks of Irish portrait artists, there is no written record of his connection with Ireland, although his father, a Covent Garden baker, was believed to have been born in Cork and Fagan himself claimed to be Irish. Born in London, he studied drawing and painting at the Royal Academy schools, and in 1783 - after receiving a significant inheritance upon the death of his father - he travelled to Paris and thereafter to Rome, where he spent the remainder of his life. He married twice, both times to Italian women of great beauty, and enjoyed a life full of enterprise and circumstance. As a painter, he specialized in portraiture, acquiring numerous clients from the ranks of fashionable and wealthy visitors to Rome. Among his outstanding works are Portrait of Lady Mainwaring (c.1792-3), Sir Corbet Corbet, His Wife and Dog (c.1797), Self-Portrait With Second Wife (c.1805), and Portrait of Margaret Simpson at Hibernia (c.1805) - the latter complete with harp, wolfhound and shamrock border. In addition to his career as a portraitist, Fagan bought and sold paintings, as well as ancient sculpture and other antiquities. In his mid-40s he even entered the world of diplomacy when, after considerable string-pulling, he contrived to have himself installed as Consul-General for Sicily! In 1815, at the age of 54, Fagan travelled to England at the request of one of his patrons, to execute a series of classical murals. Failing to complete this work, he returned to Rome, and the following year - in response to mounting financial pressure - committed suicide by jumping from an upstairs window. Today, he is seen as one of the major Irish artists of the 18th century.  For the evolution of Anglo-Irish painting, see History of Irish Art.  For more biographies of Irish artists, see: Homepage.  For more about paintings of Ireland, see: Irish Art Guide.  For a review of fine art in Ireland, see Irish Painting.